Ford Fiesta Review 2019 | What Car? Imagine a city the size of Glasgow. Now imagine every single person living in it driving around in the same car. Well, that gives you a fair idea how many have bought a Ford Fiesta in Britain in the past decade. 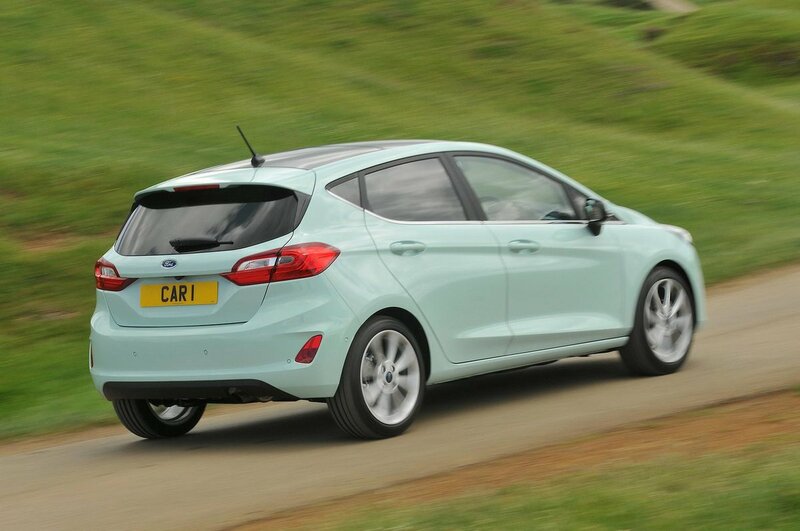 Yep – Ford's humble hatchback has been the country’s most popular car for years. And with good reason. 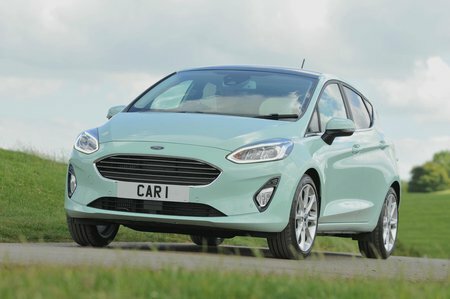 Recent generations have been touted as the best handling car in the small car class, earning the Fiesta a solid reputation for driver appeal. There are also some fine engines to choose from, the most noteworthy of which are the 1.0-litre turbo Ecoboost units that come in a variety of power outputs. There’s also plenty of choice regarding how your Fiesta looks. You can have a regular one that looks like butter wouldn’t melt, a far sportier ST-Line that apes the near 200bhp Fiesta ST hot hatch, or opt for a touch of class with the chrome-adorned Vignale. Ford has even considered the booming popularity of small SUVs by offering an ‘Active’ version, complete with tough-looking black wheelarch extensions, a jacked up ride height and roof rails, too. However, while the latest Fiesta builds on the talents of the Mk6 Fiesta, competition in the small car class is now fiercer than ever. The latest Seat Ibiza and its sibling the Volkswagen Polo are both thoroughly brilliant all-rounders, and the Skoda Fabia offers space and value in abundance. Does the latest Fiesta have the talents to compete? And which engines and trims make the most sense? We’ll tell you all you need to know over the next few pages. If you've already decided the Fiesta is the car for you, have a look at our New Car Buying page for the best deals. The entry-level 1.1-litre petrol engine has just 69bhp, although there’s a stronger version with a more respectable 84bhp. We haven’t tried the entry-level one, but the 84bhp unit does feel a bit gutless on faster roads, so it’s certainly worth opting for the pokier turbocharged Ecoboost engines. These come in a variety of power outputs, starting with the 99bhp 1.0 Ecoboost. This a great engine that is peppy around town and comfortable on longer motorway trips. The sweet spot in the range, though, is the 123bhp version that offers a step up in pace (without much additional cost), while the 138bhp version pulls eagerly from low revs yet loves to be revved beyond 6000rpm. The fastest petrol, of course, is the Fiesta ST, which we've reviewed separately. There are two 1.5-litre TDCi diesel engines available, but you’ll have to do a seriously high mileage to justify their significantly higher purchase price. For most people, the decently frugal Ecoboost units will make more financial sense. One of the most appealing things about the Fiesta is how it combines small car fun with big car sophistication, and that’s true of the way it rides. Steer clear of the larger optional alloy wheels and the Fiesta deals brilliantly with the sort of nasty sharp-edged bumps and potholes that are all too common on British backroads. The Fiesta is one of the most comfortable choices in the small car class. Indeed, only the Volkswagen Polo can trump the Fiesta for comfort. ST-Line models have firmer sports suspension, so you feel more of the bumps as they pass beneath the car. However, the ride is still extremely well controlled, so you won't bounce up and down wildly over undulations taken at speed. If you opt for an Active model, you’ll benefit from a subtly softer ride, thanks to its higher ride height and tweaked suspension that enables the car to cope even better than the standard Fiesta with sharp jolts. On the other hand, the large wheels fitted as standard to Vignale models mean it can’t deal with surface imperfections as well as smaller-wheeled variants. The Fiesta is a humble hatchback that’s as fun to drive as some sports cars, thanks to its sharp handling and precise, well-weighted steering. Keen drivers will love its responsive, composed nature on demanding roads, but it’s the Fiesta’s ability to put a smile on your face on even the most mundane journey that’s so endearing. Indeed, while the Seat Ibiza might run it close, there is no finer handling small car than the Fiesta. ST-Line versions receive sports suspension with a lower ride height. This makes the Fiesta even more agile and grippy, which is great if you want hot hatch handling without the bigger bills that a powerful engine brings. If you do want the full-fat hot hatchback experience, you can read all about the Fiesta ST by clicking here. Active versions, meanwhile, have a slightly blunter dynamic edge compared with other Fiestas because of their 18mm increase in ride height. The car’s body rolls a tad more in corners and generally doesn’t feel quite so well tied down through fast, twisty bends – although the difference is only slight. A further addition to Active is the choice of three drive modes: Normal, Eco and Slippery. The first two settings are fairly self-explanatory, while Slippery mode adjusts the traction control to help when you're driving on lower-grip surfaces. The 1.0 Ecoboost engine is remarkably smooth and quiet for a three-cylinder unit. Accelerate hard and you feel and hear less of a buzz than you do in rivals with equivalent engines, such as the Ibiza and Skoda Fabia. There's some road noise, particularly on versions with larger alloy wheels, but not enough to really irritate. However, there is a little bit of wind noise at motorway speeds, especially in models fitted with a panoramic glass roof. 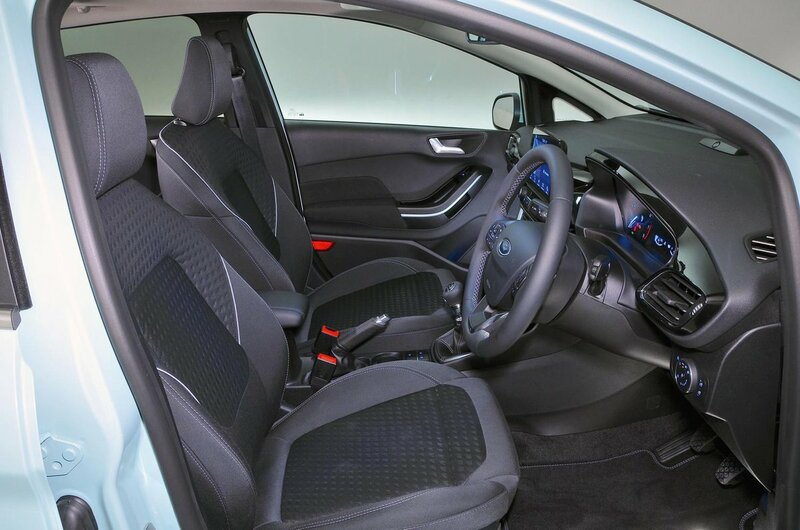 Meanwhile, the Fiesta’s accelerator, brake and clutch pedals are all positively weighted, making it a really easy car to drive smoothly. The six-speed manual gearbox fitted to most versions is also very precise – if not quite as slick as that in the rival Ibiza – while the five-speed 'box in 1.1-litre models is just as enjoyable to use.